Mary Daniel Hobson has been enjoying a personal Renaissance since moving beyond the two dimensions of photography, exploring her interior landscape, and ours, as much as the outer, natural world. We had an email exchange of questions and answers; here’s what they were. Q: Do you still consider yourself a photographer? Can you see yourself ever returning to "just" taking photographs? A: Yes, I do still consider myself a photographer. As an artist, photography is where I came from and is a strong component of all of my work. I became captivated with photography at the age of fourteen and spent the first decade of my photographic life working in a traditional black and white darkroom. Eventually, due primarily to my intensive studies of Surrealism, I became interested in expressing more depth and complexity in my work than I could achieve with a straight black and white print. 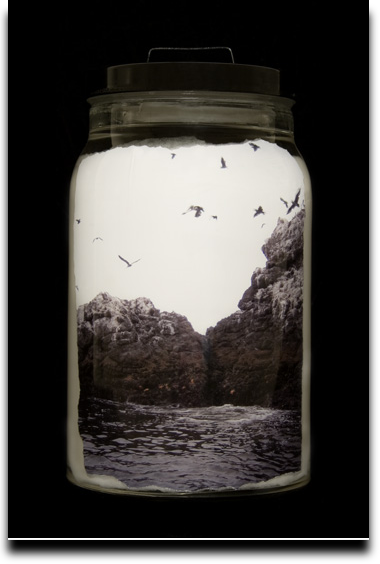 At that point, I began experimenting with mixed media photography – creating layered collages and sculptural pieces. In all of these works, photography remains a crucial, if not the crucial, element. Recently, I actually have returned to a more straight photographic process. In two new series, Evocations and Sanctuary, the final pieces are flat prints. Both series involve the creation of intricate still lives, which are then photographed. For example, in Sanctuary, I start by photographing a spot in nature I consider to be refuge for me. I then bottle that photograph in mineral oil with other elements like maps and handwritten texts, creating a layered sculpture, which I then re-photograph against black velvet. It is this photograph that gets printed and becomes the final work. 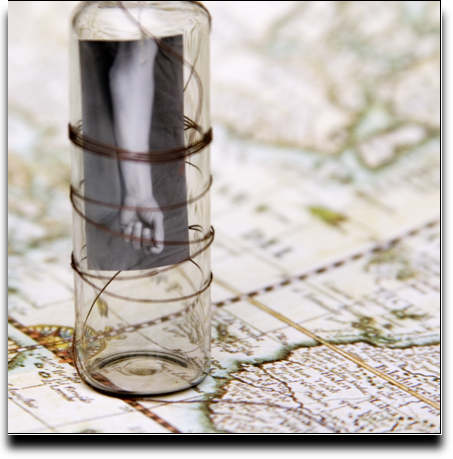 In Evocations, I build still lives using bottles, photographs of the human figure, old maps, botanical drawings and other objects and then photograph these, creating a series of prints. Although I am still doing a lot of constructing and building, these two series do represent a return to the more traditionally photographic. Q: Do you know where you’re going when you set out to create a new piece? How often are you surprised by the results? A: Some days I do. Some days I just leap in and see where it takes me. In general, I focus on creating series of work, so once a series has found its direction, I then seek to build on it. In beginning a new series, I often start out by daydreaming, journaling, reading, playing with the materials and objects in my studio. Once a series has defined itself, then there is a certain structure in place that I follow and play within. For example, in my series, Mapping the Body, I wanted to express the emotions and experiences housed within the body. The technique I settled on was kodalith transparency with layered collage, which I really loved because by printing images of the body on kodalith, the skin was rendered clear, so that you could literally look through it to the inner complexity below. To keep the series consistent, the pieces were all based on an image of the body printed on kodalith and then layered with other items and framed tightly. Within a series’ guidelines, however, there is a lot of room to play, and it is within this space that the creator in me revels and is often surprised by the results. 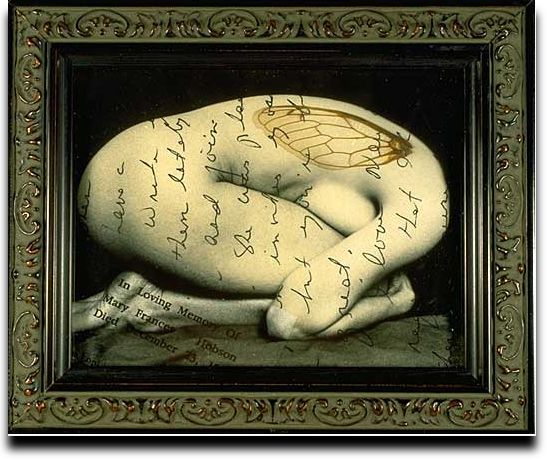 Q: When you reach for objects from nature in your collages, or capture scenes through your camera, do they represent the same metaphors to you; are there motifs that have remained throughout the body of your work? A: I do really consider myself to be a symbolist. I love the poetic associations of objects. I have worked consistently with several elements over the past twelve years – objects like fishhooks, needles and thread, old maps, handwriting, sheet music, and in the past few years, bottles. Photographically, I have been consistently drawn to the human figure as well as the landscape close to my home which includes the Pacific Ocean. I hesitate to define the meaning of these motifs, but rather like to leave them open-ended so that the myriad associations they connote can emerge and co-mingle. It creates a certain ambiguity that I hope allows each viewer to find their own unique meaning within the work. 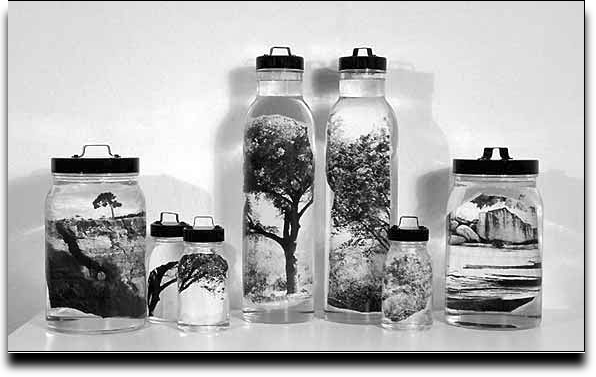 Q: From your introduction to "Bottle Dreams": "I have been particularly drawn to imagery of the natural world because it is nature that science has worked so hard to seal and study while paradoxically it is nature that holds mysteries larger than can ever possibly be contained." Does art hold any advantage over science in exploring nature’s mysteries? A: I think the advantage that art holds over science is that art is much more open to the imagination. Art is also is not restricted by having to stick to the facts. Science allows us to deepen our understanding of the world around us. Art allows us to deepen our understanding of the world within us – emotions, memories, experiences, dreams – things that the scientific method is challenged to quantify. Q: Photography seems to have a limited function for the artist wishing to explore her internal landscape; could much of your work be seen as an attempt to overcome that? A: I did indeed turn to a mixed media approach in the early 90’s, because I was seeking to express something about the lives of emotions that I could not articulate fully in a straight photograph. Yet, I do know photographers who capture psychology, interiority, mystery, and surrealism in a simple straight photograph. I, however, was not able to achieve it, and so I took the path that opened for me, which was working in a mixed media manner. I felt that I really blossomed as an artist working in this way. Another way to say this is that each artist finds the tools they need to best express themselves, and for me those tools have been an expansive sense of photography that includes the tactility of collage and sculpture. Q: Is it fair to say that your work also shows what can happen when a photographer, through the manipulation of nature, drifts into the realm of the environmental artist? A: I would really hesitate to describe myself as an environmental artist. Yes, my work at times engages the natural world, but really from a distinctly personal and interior place. I know of many wonderful artists who are true environmental artists, creating work that aims to transform our current environmental crisis. You could see wonderful examples of those artists work on web sites like the greenmuseum.org, the Women Environmental Artists Directory, and also in the projects section of artheals.org. Q: Is there an intent in your work to provoke the viewer into a re-engagement with nature, with the world around them? A: I would not go so far as to say that I intend my work to provoke a re-engagement with nature. If that happens, that’s wonderful. However, I really feel my work is much more about interiority. I would hope that someone looking at my work might be inspired to re-engage their own imagination and inner world. Q: Should artists shoulder the responsibility of re-engaging people with nature? A: Only if they feel it is their true work. It is wonderful when they do – whether it is environmental artists like the ones on the web sites I mentioned above, or an artist whose work I love, Keri Smith, author of the Guerrilla Art Kit, which invites people to leave anonymous gifts in the environment (a chalked quote, a patterned collection of leaves, etc) that awaken a sense of wonder and surprise in those who discover it. My feeling is that the main responsibility of the artist is to surrender deeply to the creative process and make the best work possible. I have this quote by Martha Graham tacked to my studio wall and have always felt it best describes the true responsibility of the artist. You can see more of Mary Daniel Hobson’s work at her website, marydanielhobson.com; for upcoming exhibitions, click here. Thanks, Tracy. Please let me know when you come across creative people out there that ought to be in emerson. I truly love where you are going with _emerson_ and especially this Q&A with Mary Daniel Hobson is yet another example of how on the mark you are when it comes to publishing insightful, inspiring content; the simplistic beauty of life. Who are the New Romantics? Get the emerson widget and many other great free widgets at Widgetbox!